Be a Bunny Helper and help carry on Rita’s annual tradition. One of Rita’s annual little deeds of kindness was to make Easter baskets with her mom and deliver them to children at the homeless shelter and other local agencies serving children in need. We continue this tradition and have partnered with Whiz Kids to make Easter baskets. We hope you will Hop on Over to Whiz Kids Toys and help support our efforts to bring a little bit of joy, smiles and happiness to children. We appreciate your generosity and ‘bunny help” – thanks so much! 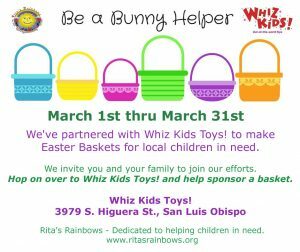 How You Can Help – Hop on over to Whiz Kids Toys! and donate towards an Easter Basket. 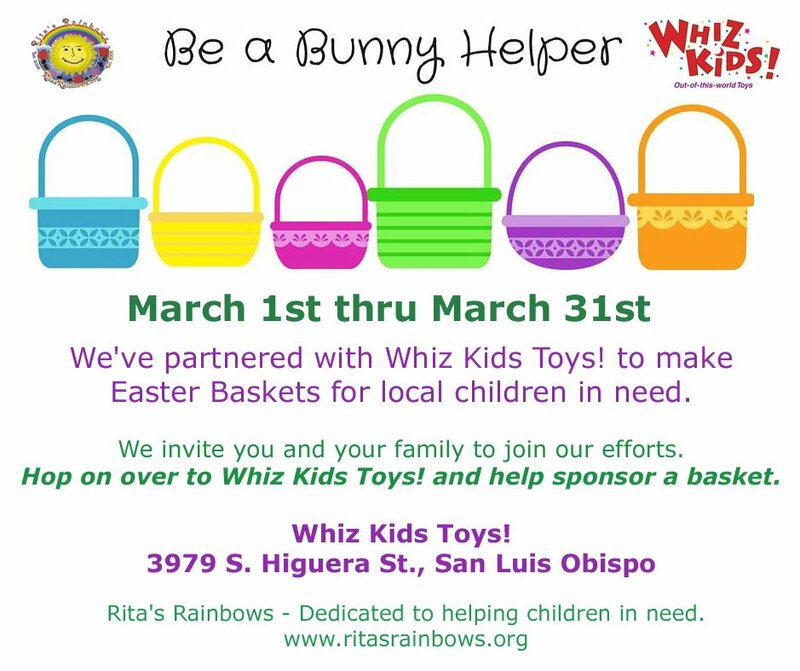 Whiz Kids Toys will assemble each basket and Rita’s Rainbows will deliver to local agencies serving children/teens in need. Donate to Rita's Rainbows !